Alberta’s political leaders squared off at CTV Edmonton Thursday night for the provincial election’s lone debate. The 90-minute debate got off to a fast start, with NDP Leader Rachel Notley and UCP Leader Jason Kenney trading jabs over the economy and pipelines. “After 10 years in Ottawa, you didn’t get a pipeline built, and so there is truly no reason we should take advice from you on this,” Notley told Kenney. Alberta Party Leader Stephen Mandel lamented “we’re going nowhere quick” with pipeline construction, while Alberta Liberal Party Leader David Khan questioned Kenney’s tactics on the subject. Kenney repeatedly went after Notley for being “allies” with Prime Minister Justin Trudeau, the carbon tax and the province’s $100-billion debt. Notley questioned Kenney’s moral leadership and integrity after the homophobic views express by a UCP candidate. She also mentioned the investigations into Jeff Callaway’s kamikaze campaign. "Many of Mr. Kenney's candidates have views that are demeaning to women, that are white supremacist, that are islamophobic and anti-LGBTQ. "If Mr. Kenney would cheat his own party members to have a chance at running to be premier, what will he do to the people of this province to keep the job?" Both Mandel and Khan criticized Notley and Kenney for their attacks on each other during the first two weeks of the campaign. The 2015 debate is often mentioned as a turning point in the election that Notley went on to win, but one analyst does not think this debate was as influential. "It's clear there was no big knockout punch, no decisive victory, and that benefits Jason Kenney as the frontrunner," Duane Bratt said. Albertans go to the polls April 16. 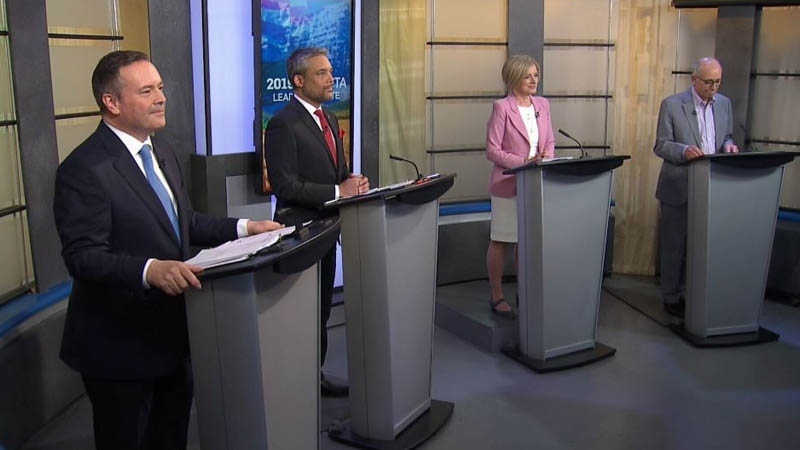 UCP Leader Jason Kenney, Liberal Party Leader David Khan, NDP Leader Rachel Notley and Alberta Party Leader Stephen Mandel participated in the 2019 Alberta Leaders Debate at CTV Edmonton.